MEMORABLE! Our wedding was also featured in a new a television series called “Four Weddings,” a new reality show on TLC where four women face off to win a dream honeymoon. What made my wedding special was that it was a union between two individuals from different backgrounds. My husband is Muslim by birth and I am Hindu by birth. Because he is a very special and a loving person, he allowed me to have my wedding day completely Hindu because of my father’s preferences. This set the stage for what became our own personal Bollywood “Jodha Akbar,” story. My Planning: My loving family as well as my in-laws and husband gave me the support I needed to make my wedding day a dream come true. I was and am the luckiest bride ever! With their love and support I decided to travel to India to make the necessary preparations for the wedding. I travelled from Mumbai to Delhi with my loving parents and elder brother for wedding cards, decorations and bridal outfits for my husband and myself. It was truly an adventure for all of us. After gathering everything we came back to Florida to start the planning process. We were a bit overwhelmed with the finances, however we managed to make it work. My advice to most brides and grooms, always stick within your budget. My husband and I can honestly say that we kept to what we had and did not go over budget and still enjoyed our wedding immensely. It was everything we dreamed of; a traditional Indian wedding with lots of glamour. I was blessed to have two wedding planners. I booked the Alexander Hotel in Miami Beach for my entire wedding day. With the help of both the onsite coordinator Shanti Jetwani and my wedding planner Shama LeFevre from Miami Creations, they worked tirelessly on my wedding day and before it. The end result was a wedding that was planned and executed flawlessly! My wedding outfits were designer outfits bought in Mumbai. I had some say in the design and look of it. I never wanted to be a disco ball bride, meaning that all people saw was an outfit. I wanted people to see me the bride and not covered in beads, sequins and Swarovski crystals as every Indian bride is today. I also wanted to go back to traditional look for my husband and myself. We chose burgundy and white instead of the more contemporary pinks and blues. This was a mission! When I got to Delhi I visited Chandi Chowk, the Mecca of wedding cards. I was overwhelmed with options. Thank god for my elder brother who helped me sort through the gibberish and decide amongst all of them. There were literally thousands of vendors selling wedding cards. As we were leaving the “wedding card village” my brother found that one card. It was card that looked like a picture frame; it was wooden mahogany that had a pearl in the middle and the card opened up like a usual wedding card. The card shop owner said the card we chose was a mogul style wedding card used centuries ago. I knew this was the card that was meant for my “Jodha Akbhar” wedding. I knew that this invitation would surely set the mood to the type of wedding I was planning. When we sent out the invitations, everyone called to say it was the most spectacular wedding card they had ever received. This was exactly what I wanted to share with all my family and friends; something unique and something they could share. When selecting my food I knew exactly who I was going to contact for my wedding day. My good friend Gopaul from Bombay Grill made great suggestions to suit the tastes of my guests. Everyone loved the cocktail selection and food choices immensely. He worked within our budget and helped us make our day very tasty indeed. There are no words to describe how thankful we are to our decorator Rakesh Anand. His motto is “we want your dreams to come true and that’s all that matters.” Because of financial issues I took it upon myself to create my own wedding décor, however 2 weeks before my big day we knew that hiring someone would be financially worth it because it was costing us more than expected. We contacted many vendors who were not willing to work within our budget. However, Anand was very compassionate. Anand made our wedding look and feel like a platinum wedding on an aluminum budget. We will forever be grateful to him and his staff and will always recommended him because of his ability to make dreams come true. I was fortunate to have DJ Bhuwan Satyaketu from DJ Booze for entertainment and lighting for my wedding. He was just an amazing DJ, everyone truly enjoyed his selections. Without my DJ, the wedding would not have been as entertaining, there was never a moment when the dance floor was empty. Aside from the music, DJ Booze’s partner Laura did a fantastic job as the Master of Ceremonies. My photographer for my wedding day was Alvaro Salazar from http://www.alvarosalazarphotographer.com/ Please check out his link to see some samples of our wedding and his amazing artistry. My prewedding photographer was Harry Cyriaque from H. Q. PhotoMakeup and Hair: My Makeup artist Aradia and hair stylist Kie from the “Art of Beauty by Aradia,” in Miami Beach made me look like a true superstar. http://www.bridalmakeovers.com/ I have to say that my makeup artist made me look like a true Indian bride. She did not mask my face with white powder and instead enhanced my natural beauty. I was very scared that I would not find that makeup artist who would listen to what I wanted as my wedding look. Everyone kept complimented me on how naturally beautiful I looked and how my hairstyles complimented my traditional Indian outfits perfectly. This was a bit of a challenge. Since I am vegetarian and my wedding was catered to vegetarians, finding a cake caterer to make eggless wedding cakes was very difficult. I managed to stumble upon Gallery of Cakes located in Aventura, FL. She took my ideas and suggestions and made me the cake of my dreams. Not only was it absolutely breathtaking but it was delicious as well. Two of my vendors submitted me for a reality show on TLC called “Four Weddings,” and I got selected because of the uniqueness of Indian Weddings. 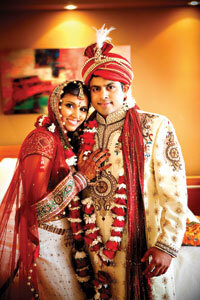 We all know how glamorous and colorful Indian weddings can be compared to traditional western/American weddings. My dream of a true Bollywood wedding was coming true because it would be televised for the world to see it. When we finally saw the show, I was happy to see that viewers got the essence of an Indian wedding. From the live drumming and singing to the amazing Bhangra dancers, it was quite a spectacular event. Although we did not win, many people who saw the show, including those in production thought our wedding was one of the best weddings they ever attended. This alone gave me enough satisfaction. I did win. I get to spend the rest of my life with the man of my dreams! My husband and I would never forget our wedding because of the amazing people who helped us make it a true Bollwood story. We can honestly say that it was one of the greatest days ever and if we could do it all over again there is nothing that we will change about our wedding day!